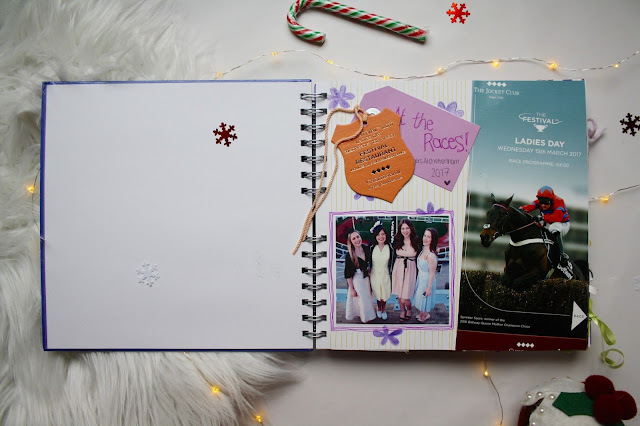 The first section of my book commemorates my day out at Cheltenham Races with some of my gorgeous blogger friends. I printed out some photos that we had taken on the day, and combined them with cuttings from the race day programme. 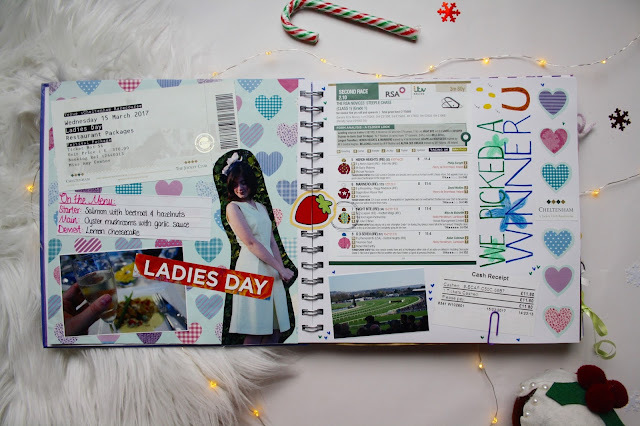 I used old birthday gift wrap for the background of one of the pages, and simple additions like travel tickets from the day and my winning betting slip made these pages really come alive! You may notice a sticker from my friend Ellis's online shop there as well! 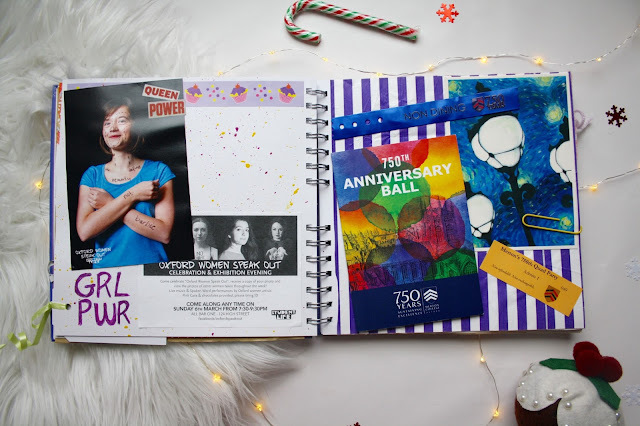 I must also admit that my scrapbook is by no means in chronological order, as directly after my #BloggersAtCheltenham experience, I stuck in my mementos from the Winter Ball that I attended back in December of 2016! I used some custom-made snowflake stickers for the background, as well as including the ball programme, some photos and frosty blue writing to stick with the wintry theme! This page is really simple but oh-so effective! 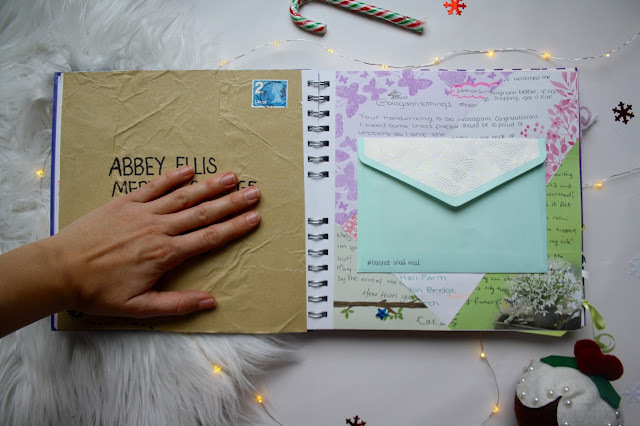 Next up comes a couple of pages dedicated to my participation in the #beechat snail mail scheme, which I've been a part of for over a year now! 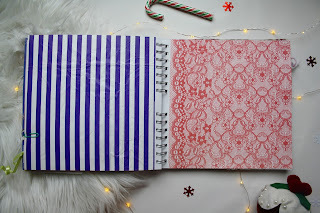 I write to four or five other bloggers very regularly, and I cut up some of the first letters I ever received to form the background for this page! In the envelope on the right hand side, I placed some of the letters which are most special to me, so that I can keep them safe and take them out to read them! The left page was designed to look like the front of an envelope, using brown paper and an old stamp (obviously I'm covering up my address)! Now, I told you that this book was definitely not in chronological order, and we're actually going on a throwback to 2015 for these photos! The left hand page has a photo from a feminist shoot that I took part in, where the idea was to write across your body the message that you have for other women on International Women's Day. My message read "You define beauty, not Barbie", and I also had plastic-surgery style hatchings across my neck and face to show just how unrealistic Barbie's proportions really were! For the background to this page, I used flecks of multicoloured paint, which turned out so well. The right hand page shows mementos from another uni ball that I attended in 2015. 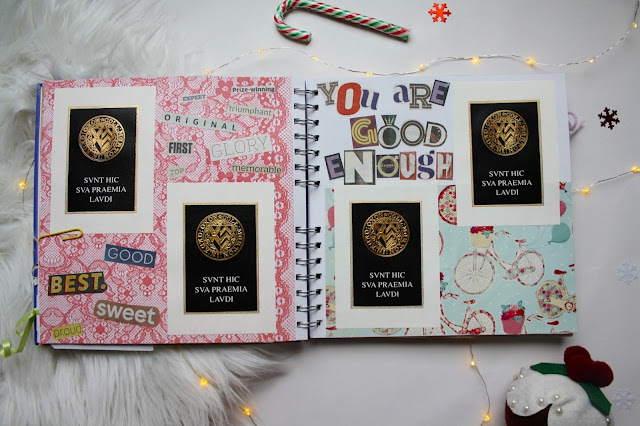 On these pages, I decided to stick on some of the academic awards that I won during my time at Oxford and turn this into a page celebrating achievement and self-love. I wanted to remind myself that I am absolutely capable of being engaged in the academic work that I am still doing, so I cut out letters from a newspaper to spell out "YOU ARE GOOD ENOUGH" and then I found other positive adjectives throughout the paper and cut these out as something to look back on if I'm having a down day. On the left here, we have a Beauty and the Beast themed page, which has fake flower petals on to allude to the Beast's rose! 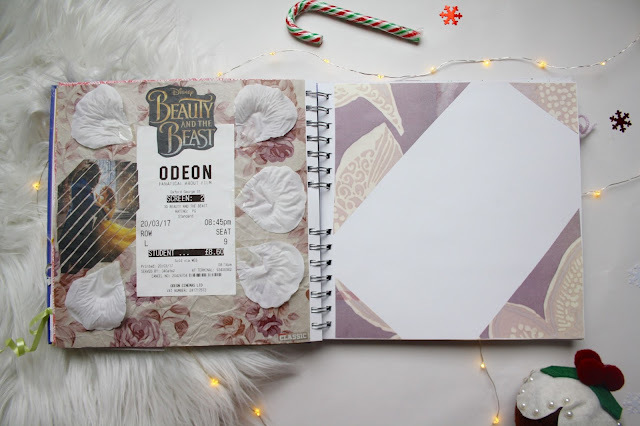 I went on a solo date to see Beauty and the Beast and I wanted to commemorate the beautiful film with something equally eyecatching in my scrapbook. I'm really proud of this page, but I need a little something extra to finish it off, I'm not sure what yet! I decided to do something a little different with the photo of Belle and the Beast, slicing it diagonally all the way across and then sticking the strips onto the page. I really like the effect of this, you can still see what the photo represents but it gives the page an extra summin' summin'. The photos above show some of my most recently created pages. In November, I went on a trip to the Hepworth Wakefield art gallery with my PhD funding body and I was blown away by their exhibition of Alina Szapocznikow's work. Szapocznikow is a 20th Century artist predominantly interested in the human form. She was incredibly inventive, using casting to create works that were at the same time cute/beautiful and somewhat grotesque. 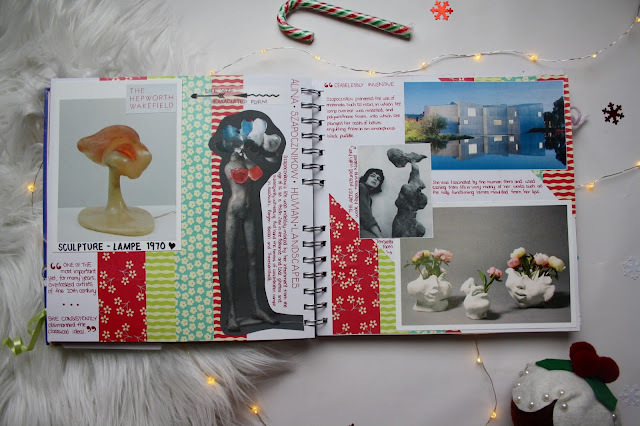 I found her art so interesting that I just had to create a few pages inspired by this exhibition viewing. I purchased some postcards of her sculptures from the gallery, and cut up a flyer about the exhibition for some extra imagery! And finally, the remaining photos just show some backgrounds that I've created, ready to stick things on to! 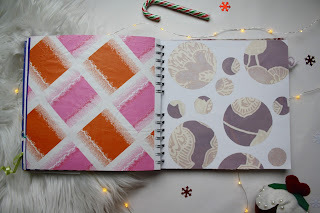 Using a colourful background instead of leaving the page just plain white is a super easy way to jazz up a scrapbook. Gift wrap is my favourite thing to use - you can stick it on to cover the full page, or cut shapes out of it like the circles I made below! I've also saved everything from paper bags which Etsy orders are delivered in to tissue paper from shoeboxes for backgrounds! Once you start getting creative, there's no end of ways to re-use things that would otherwise just go in the bin. 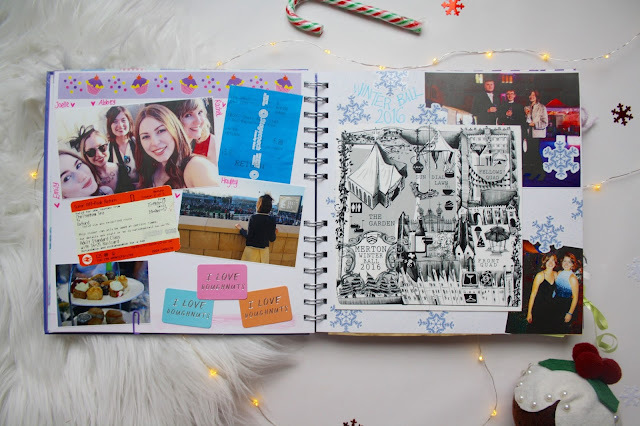 My favourite thing about scrapbooking is that you can really let your imagination run wild and create some really beautiful pages! You can add extra texture using paperclips and glitter, punch holes in the pages to add on tags, and use pencils, crayons, and felt tips to decorate as well. 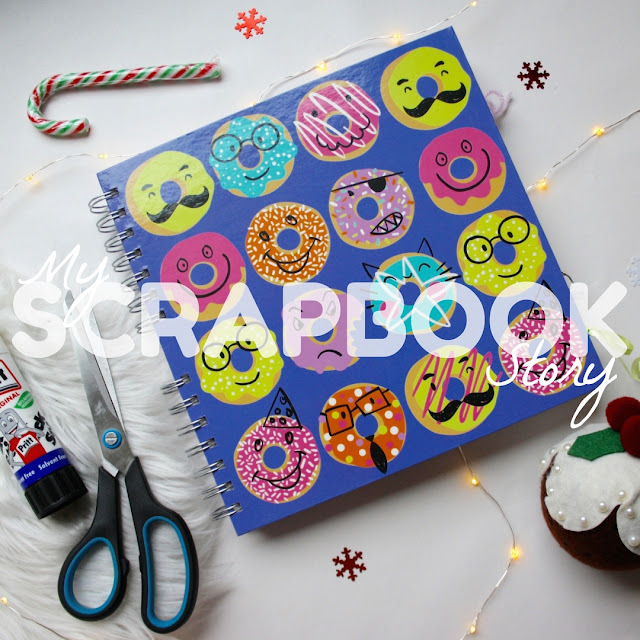 One important thing to remember if you want to start a scrapbook is this: you can NEVER do it "wrong"! 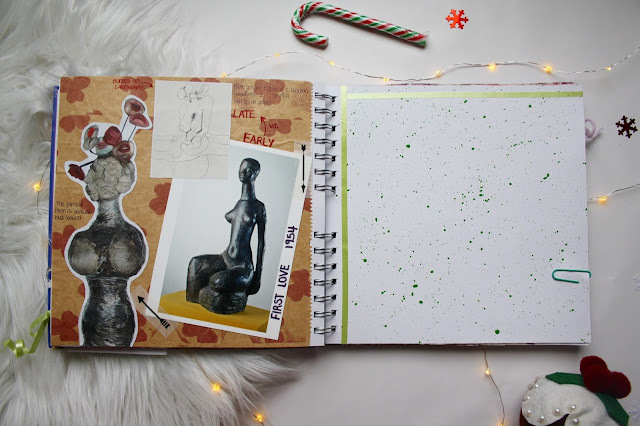 Your creation will be entirely unique and purely yours, and you can make your scrapbook look however you want it to! You could follow my lead, or take it in an entirely different direction! Just go for it! I hope you've enjoyed this little tour of my creative outlet! Do you have a scrapbook? Tell me in the comments below!